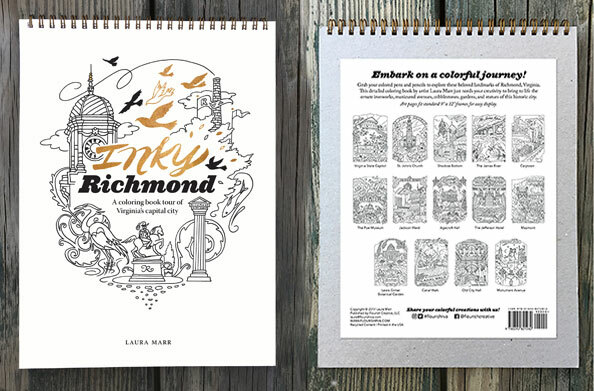 RICHMOND, VA – Local artist and designer Laura Marr proudly unveils Inky Richmond, an elegant pen-and-ink-drawn coloring book that pays tribute to many of Richmond’s beloved landmarks. The book, beautifully printed and perfect for gift-giving, allows those who love Richmond to roll up their sleeves and join in the fun of coloring some of the city’s most historic and eclectic sites. Visit www.flourishrva.com/shop or the local merchants listed below to purchase. The project grew from Marr’s love of drawing, especially when she travels, and from a recurring wish to create something special from the many sketches she had amassed of Richmond over the years. The recent popularity of adult coloring books further spurred the momentum. Encouraged by family and friends to publish her work, the project took shape with the inspiration of combining a coloring book with a tribute to the richness of Richmond’s scenery, as a way to share the city with others and to motivate visitors to experience its many sites. The result is a detailed coloring book that presents tableaus of well-known Richmond landmarks including; the Virginia State Capitol, St. John’s Church, the Poe Museum, Maymont and more. Each page captures the era or mood of the subject matter and includes native flora and fauna. The locally produced and printed book features fourteen scenes, a foil-stamped cover and a brief history of each building or landmark at the back of the book. The quality of the design and heavy cover stock makes it perfect for framing, even without color added, and the illustrations offer an inviting foundation for coloring enthusiasts to add their own artistic touches with a variety of mediums. “Growing up with the ability to draw, people have often told me ‘I wish I could do that,’ says Marr. “People want to create art, but there are many reasons why they don’t. Whether it’s a lack of time or not feeling confident in their skills, the popularity of coloring books over the last few years is a testament to how people enjoy creative expression, for stress relief, relaxation, social interaction and more.” She felt that many of the coloring books available were lacking a sense of place. That’s why crafting Inky Richmond with details specific to the city and its sights was important. Marr’s aim was to create something meaningful for those who love Richmond, not just another mass-produced coloring exercise, but hand-drawn images of local sites that residents connect with and support. “It’s a celebration of Richmond and I hope that coloring the scenes gives people a sense of pride in our city while they are making their own works of art,” says Marr. “I’m excited to see how the illustrations inspire others to create.” Inky Richmond coloring books ($28) are available at The Jefferson Hotel’s Gators Gift Shop, Agecroft Hall, Papeterie in Bon Air, The Richmond Convention Center Gift Shop, and online: www.flourishrva.com/shop. Laura Marr is an illustrator, designer, and creative director who has illustrated for magazines, children’s books, greeting card companies and more. Marr operates Flourish Creative and Inky Richmond is her first book.